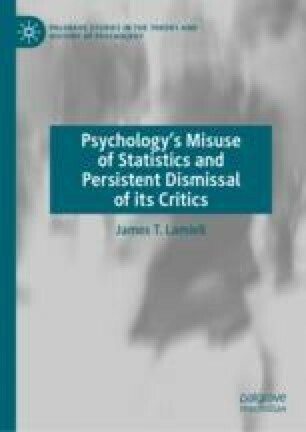 This chapter is focused on that historical development, beginning early in the twentieth century, through which experimental psychologists gradually abandoned the original ‘Leipzig’ model of investigation, in which research findings were fully defined for individual subjects, in favor of a treatment group model of investigation, in which research findings were defined by statistical comparisons of group averages. Conspicuously absent over the several decades of that historical development was a critical discussion of the conceptual implications of the obvious procedural differences between the two models. The rightful place of such a discussion was taken by a widespread but completely unexamined assumption of full epistemic continuity between the two models, i.e., the assumption that treatment group experimentation is formally suited to the same overarching knowledge objective as had been established by the original Leipzig model experimentalists: that of discovering the general laws presumed to regulate the psychological functioning of individuals. The present chapter first documents the underlying presence of that paradigmatic belief and then explains its implicit conceptual requirements. In this way, the stage is set for the critical analysis to follow in the next chapter.